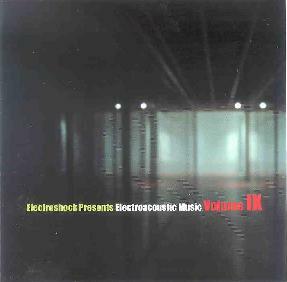 Various Artists - "Electroshock Presents Electroacoustic Music Volume IX"
From The Netherlands, Gottfried Michael Koenig's entry is an interesting blend of spacey atmospherics, sci-fi effects and whimsical sound patterns. Carl Stone (San Francisco) offers an outstanding space ambient piece with a focus on howling tonal effects that feels like a sonic rod pulsating between the ears and massaging the brain. Listening to this with headphones was just as much physical as it was a listening experience. Mexican artist Rodrigo Sigal gives us a hot cosmic ride with swirling alien electronics, freaky effects, voices samples, orchestrations and a healthy dose of avant-garde elements. Noise and clattering intermingle with a totally spaced out vibe for some creatively collaged fun. Lots happening on this one. Mark Cooley is a Missouri resident who starts off with a spacey and somewhat noisey sound-art pattern. But he soon does an abrupt transition to an acoustic guitar ambient Bluegrass piece. Wow... that was the last thing I was expecting! So I'm enjoying the guitar, but a noise pattern takes over and develops into a strange Residents-like bit, and then.... well, you get the idea. Cooley is really all over the map, but this is indeed interesting. Baltimore, Maryland based Vivain Adelberg Rudow's contribution begins with a tear-jerker melody and narration by Cuban lawyer Juan Bainco, describing his experiences practicing law in Cuba. The music zooms through a parade of stylings including show tunes, Latin rhythms, carnival music, and much more. Pretty wild stuff. British sound artist Simon Wickham-Smith contributes a very cool spaced out string of pieces that are like a cross between Forbidden Planet, Phillip Glass and The Residents. Russian ensemble Eternal Wanderers open with a dark and slightly sardonic piano bit. But the piano is soon joined by spacey effects and we enter into a symphonic progressive realm with female voice narration in English. Very interesting use of orchestral, symphonic and spaced out elements. I'd love to hear more from these folks. Finally, Victor Cerullo (Italy) is the one contributor to this collection whose work I was already familiar with (see review of his Visions: A Homage To Andrei Tarkovsky in AI #23). Cerullo gets plenty of room to stretch out with the 22 minute "Rusalki", a heavenly cosmic space ambient journey. Put on the headphones... close your eyes... ahhhhhhhhh.... bliss. All the Electrock Presents compilations feature some of the most creative experimental electro-acoustic music, and always with the best production and sound. Highest recommendation on all of them.